With the many challenges facing young people looking to follow a creative pathway, AccessHE’s The Arts and Design forum identified the opportunity for widening participation teams to work collaboratively with local cultural partners. submit strong applications to creative higher education courses. For the last year, the AccessHE Creative Network have been hard at work producing a resource an application guide for Creative HE subjects. Launched in July 2018 as part of AccessHE Week 2018, the AccessHE Creative HE Apply Guide offers information and support for learners interested in applying to creative HE courses who are otherwise discouraged from pursuing their passions for the Creative Arts. Alongside this is also the AccessHE Creative website, an online resource for prospective students, parents, carers, teachers and advisers, which aims to share information about the wealth of creative HE courses available, information on how to prepare for applying as well as opportunities to develop skills and get involved in the creative arts. We hope that those teaching and supporting a wide range of creative subjects, including but not limited to Art, Dance, Drama, Design Technology, Music, Photography or Textiles, will benefit from both resources. 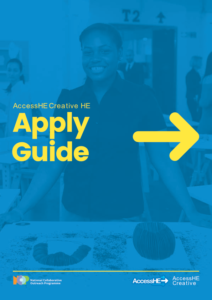 If you would like to find out more about AccessHE Creative, or to request FREE hard copies of the AccessHE Apply Guide please contact Vanessa.Baptista@londonhigher.ac.uk.